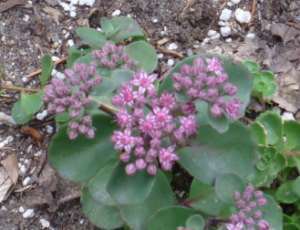 The best Sedum for borders are the taller types such as Sedum spectabile and Sedum telephium varieties. They add height and structure to mixed plantings of other xeric plants and have been enthusiastically promoted by landscape designers for planting with grasses. The fleshy stems and leaves of these old fashioned perennial plants are a welcome sight as they emerge from the soil in the spring. I've heard some gardeners complain that these are invasive, but in my garden they grow in a tight clump, seldom growing out of bounds. Occasionally, I'll find some self sown seedlings, but they're easy to remove. Established plantings not so much - they have extremely thick and fleshy roots. Many border types are grown for the dark purple hue of foliage, or the pink of the long-lasting blooms. The flower heads on the tough and adaptable plants age to a dark mahogany brown adding interest to the winter garden - another excellent reason to leave the stems until the spring. All these Sedum varieties grow best in sandy well drained soil, and survive just fine with minimal watering once established. 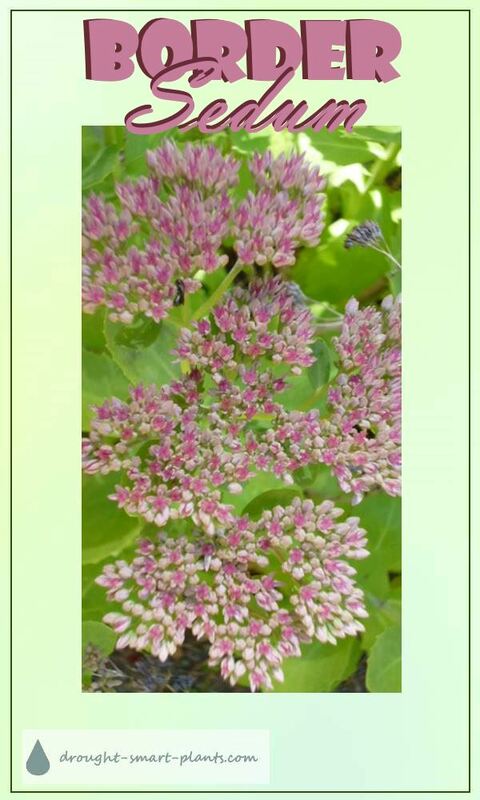 Sedum of all kinds are great plants for bees and other beneficial insects which visit regularly all summer to get the nectar in these great landing pad flowers. Find out about using these great flowers in your butterfly garden to attract even more of these beautiful insects. As well as being a major magnet for insects, border Sedum have a reputation for being iron tough in the xeric garden, and it's well deserved. 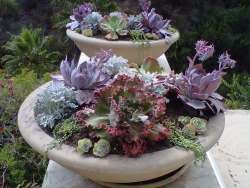 Their succulent leaves form a backdrop for other plants, with the ability to shrug off challenging weather, poor soil and drought conditions. If hail or other damage occurs, prune the stems right back to the ground and voila! Fresh new growth emerges better than ever. Sandy, well drained conditions are best, with the addition of a small amount of organic matter such as compost or worm castings for a bit of nutrition. 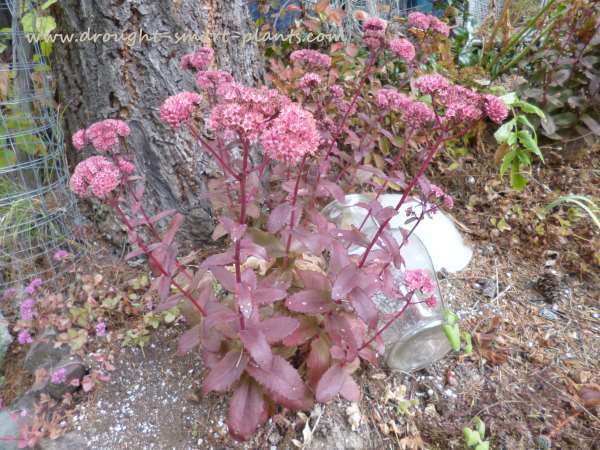 Water your newly planted Sedum until established, otherwise, nature will take care of it for you. Sedum ruprechtii 'Habs Grey' is the odd one in this group. It seems about halfway between the shorter Sedum 'Vera Jameson' and the larger Sedum 'Autumn Joy', with leaves very similar to Sedum matrona, but it's got creamy white flowers. 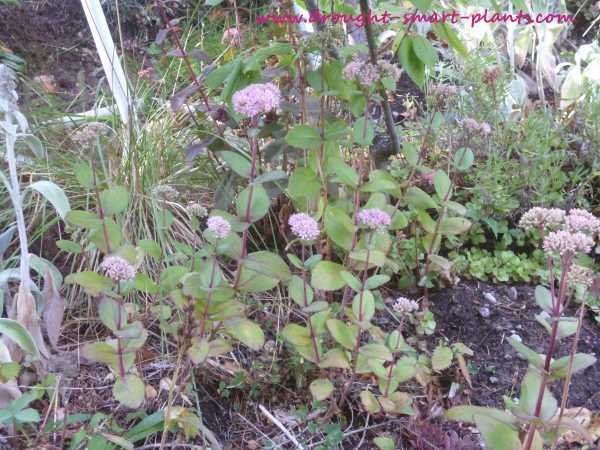 Sedum telephium x 'Autumn Joy' is probably the most well known of all the larger type Sedum as it's been promoted extensively by natural garden designers. The pale celadon green foliage, combined with salmon pink flowers that look like broccoli heads is a great contrast and as the flower heads age into a rusty red colour, they can provide some contrast and colour into the deep snows of winter. Cut the plants back to the crown in early spring to give the brand new shoots some room to grow. Leaving the old growth on the plants provides shelter for insect cocoons, and snow capture for slow release during spring melts. Sedum spectabile 'Brilliant' - soft blue green rounded leaves and deep rose red blooms, which make a friendlier colour combination with any blue to pink flowers. Sedum 'Purple Emperor' has pretty plum coloured foliage, which makes a great foil in combination with low growing Sedum, ornamental grasses and xeric plants. It has somewhat disappointing flowers lasting only a few months, not over the entire winter as 'Autumn Joy', but the foliage makes up for it. 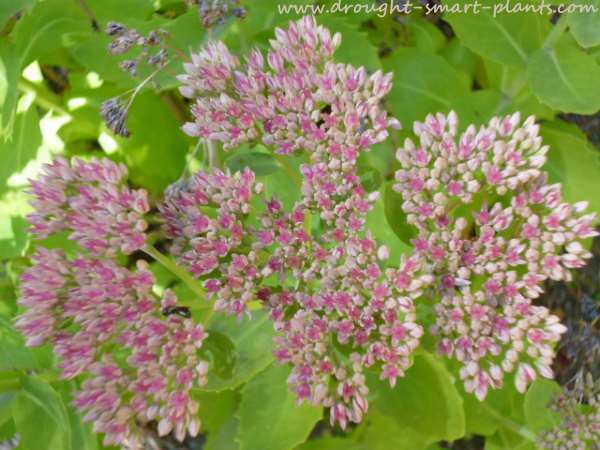 Sedum 'Matrona' - a large scale Sedum with sage green foliage and pale pink blooms. Everything about this plant is big textured, but contrasts well with many perennials as well as other Sedum in mixed borders. 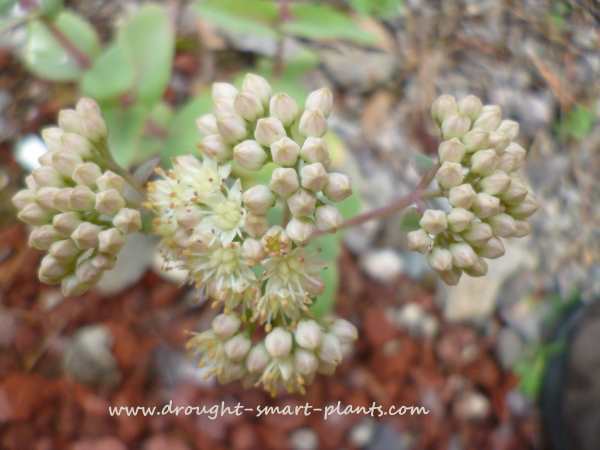 Interesting colour changes occur as Sedum Matrona battles extreme drought conditions, but these are tough plants and recover as soon as the fall rains start to fall. 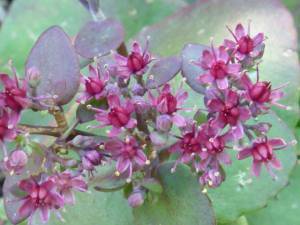 Sedum 'Vera Jameson' - a shorter statured plant with purple grey foliage and exceptional pink blooms. 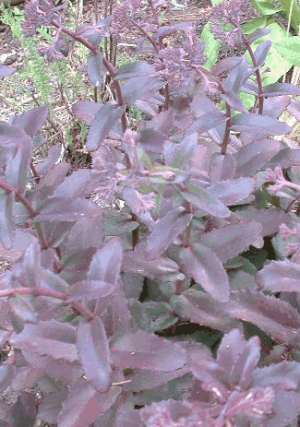 The leaves are distinctively air-brushed with darker purple mid-lines. The lovely and very different Sedum ussuriense 'Turkish Delight' with the interesting rounded foliage and delightful purple flowers. 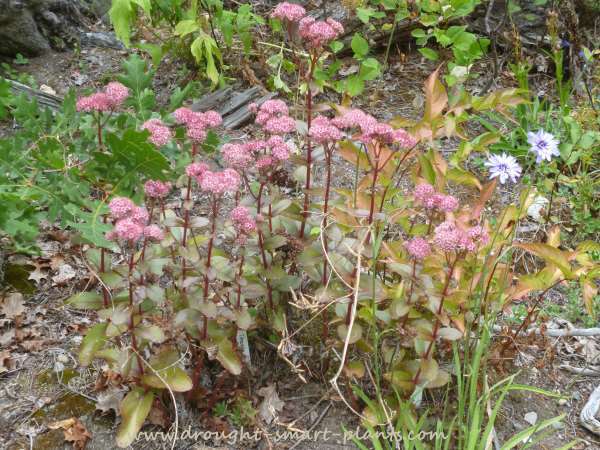 Seeds fall from the flower heads of many different Sedum spectabile, sometimes germinating into a whole new variety. These are Sedum hybrids - a selection of seedlings most likely hybrids of 'Purple Emperor' and 'Matrona', some of which have superb dark red glossy foliage, red stems or olive foliage. This one is a pretty plant, with olive green leaves on striking red stems. I call this one 'Olive' because of that. Another garden hybrid is one I call 'Red Leather' for the shiny burgundy leaves - an oddity in the spectabile world. My neighbor thought it was ugly. Really? Help identify succulent and problem?